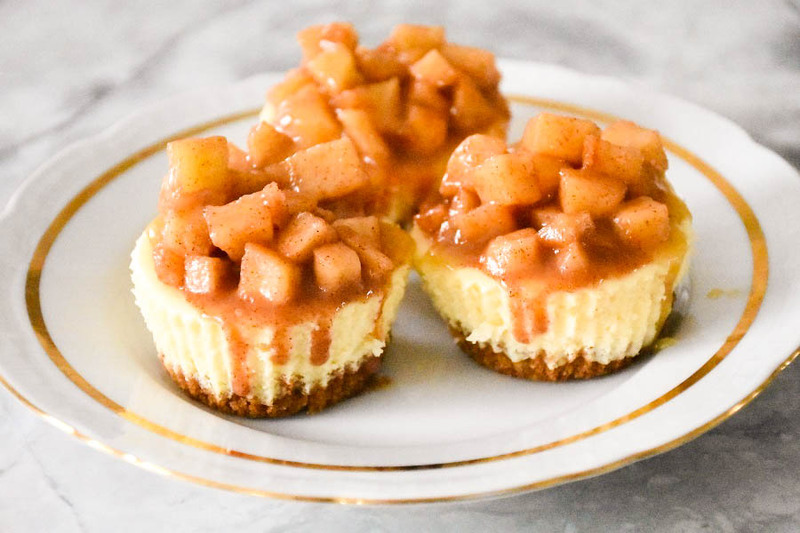 Close your eyes and imagine...Crunchy graham cookies, light and fluffy cheesecake that melts in your mouth, slightly sour green apples sweetened with cinnamon and brown sugar and all this goodness topped with delicious caramel. Now open your eyes, take a bite and enjoy! If you use the silicon muffin cups there is no need to spray or line them If you use the metal one, I line them with paper muffin cups. In a small bowl, mix together graham cracker crumbs, sugar and the melted butter. Spoon the crumbs into each cup, the full tablespoon in each and press the mixture flat into the bottom. Bake the crusts for 10 minutes and remove the pans from the oven. Set them aside to cool completely. Reduce your oven temperature to 300 F.
In the big bowl beat the cream cheese with an electric mixer until smooth, scraping down and sides of the bowl several times. I can't stress enough the importance of the cheese temperature. It should be out of the fridge and at room temperature before you starting making the cakes. Add the eggs one at a time and beat until each is incorporated. Add the heavy cream, the sugar and the vanilla and beat for about a minute. Make sure to stop and scrape the bottom and sides of the bowl. Add in the butterscotch chips and mix well by hand. Spoon the batter and fill out the cups of the pan to the top. I get about 18-20 cups. Bake for about 20-25 minutes until the cakes are set. Don't over-bake. If they start to crack take them out right away. Remove them them from the stove and place aside to cool completely. You can place them in the fridge until you are ready to decorate. In a small skillet, melt the butter and add the chopped apples. Stir in the sugar and cinnamon. Cook and stir for about 5-6 minutes until apples are soft but not mushy. Let it cool a bit and spoon it over the mini cheese cakes. 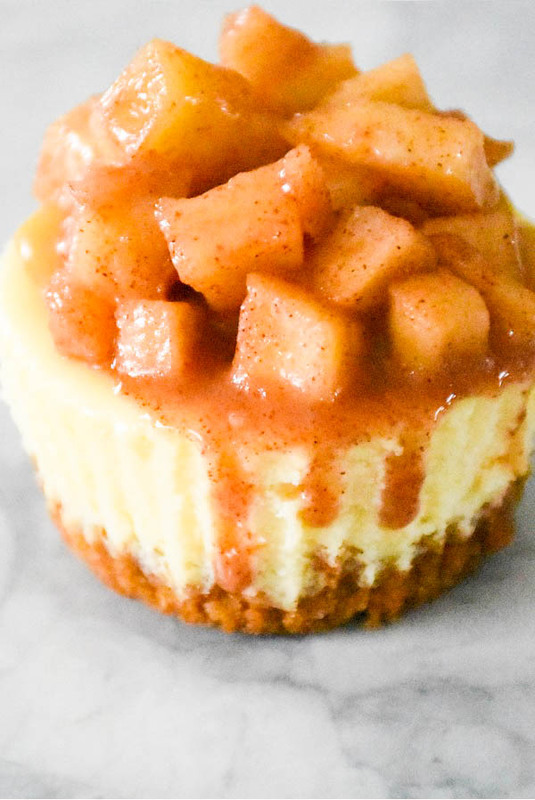 You can serve it with the warm or cold apple topping, depends on your preferences. Drizzle with caramel ice cream topping. 2. If you use the silicon muffin cups there is no need to spray or line them If you use the metal one, I line them with paper muffin cups. 3. In a small bowl, mix together graham cracker crumbs, sugar and the melted butter. 4. Spoon the crumbs into each cup, the full tablespoon in each and press the mixture flat into the bottom. Bake the crusts for 10 minutes and remove the pans from the oven. Set them aside to cool completely. 5. In the big bowl beat the cream cheese with an electric mixer until smooth, scraping down and sides of the bowl several times. I can't stress enough the importance of the cheese temperature. It should be out of the fridge and at room temperature before you starting making the cakes. 6. Add the eggs one at a time and beat until each is incorporated. 7. Add the heavy cream, the sugar and the vanilla and beat for about a minute. Make sure to stop and scrape the bottom and sides of the bowl. 8. Add in the butterscotch chips and mix well by hand. 9. Spoon the batter and fill out the cups of the pan to the top. I get about 18-20 cups. 10. Bake for about 20-25 minutes until the cakes are set. Don't over-bake. If they start to crack take them out right away. Remove them them from the stove and place aside to cool completely. You can place them in the fridge until you are ready to decorate. 11. In a small skillet, melt the butter and add the chopped apples. Stir in the sugar and cinnamon. Cook and stir for about 5-6 minutes until apples are soft but not mushy. 12. Let it cool a bit and spoon it over the mini cheese cakes. You can serve it with the warm or cold apple topping, depends on your preferences. Drizzle with caramel ice cream topping.